With their plush texture and rich, beautiful appearance, sheepskin rugs add luxury to any home. But with so many different types of sheepskin rugs available, how do you choose a rug of the highest quality? The first thing to examine when shopping for sheepskin rugs is the quality of the wool—namely, the wool density, loft, and length, and the color and feel of the wool. The density of wool refers to the amount of wool fibers per square inch. High-grade sheepskin, like that of Overland's premium Australian sheepskin rugs, has a very high wool density, largely due to the breed of sheep it comes from. Also important is the wool's loft, or its ability to stay upright and straight. A lower quality sheepskin rug may flatten quickly, or its fibers may become curly, tangled or matted, whereas high-quality rugs boast wool fibers that retain their loft beautifully. To achieve premium-grade standards, sheepskin rugs must possess both the necessary wool density and length, which is a minimum of 65 mm. Lower grade sheepskin may have the necessary length, but if it isn't dense enough, the long wool fibers won't be able to retain their loft, and the rug will end up looking shaggy. High-quality sheepskin should have a nice, natural ivory tone, unmarred by stains or discolorations in the underlying wool. Premium sheepskins in other colors should display the same clean look, with no visible imperfections. Perhaps the most enjoyable attribute of high-quality sheepskin is its soft, silky feel. Wonderfully plush to the touch, premium sheepskin adds luxurious comfort wherever it's displayed, whether next to the bed (making feet oh-so happy each morning), on the couch (cozy to snuggle up to on chilly nights), or tossed over your office chair (making workdays much comfier). 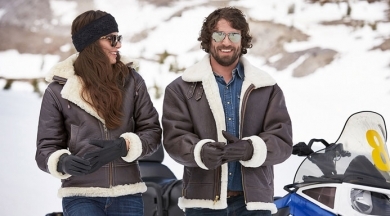 When comparing higher and lower end sheepskins, you should be able to feel the difference. Overland's premium Australian sheepskin rugs have a lusciously soft texture that you'll have to feel to believe. The quality of the leather, or underside, of sheepskin rugs is equally as important. It should be strong yet supple, and free from any odors, cracks, holes, or other defects. The leather on premium-grade sheepskins is firm and reasonably thick, with a soft, supple feel—though not so soft as to slide and wrinkle on the floor—and you won't be able to peel the layers of leather apart. Overland's premium Australian sheepskin rugs have leather undersides that have been buffed and polished with a fine stone, giving a smooth, suede finish. Lower grade sheepskins won't have nearly as good a finish—they'll typically have thinner leather that's susceptible to peeling apart or cracking under pressure. Low-grade sheepskins may have some minor holes, cracks, scratches or other defects on their undersides, which you won't find in higher grade skins. High-quality sheepskin rugs should be free of any chemical smells, which may be apparent in lower quality rugs, due to their tanning processes. Overland's premium Australian sheepskin rugs have a lusciously soft texture that you'll have to feel to believe. Premium sheepskin rugs are generally larger and more uniformly shaped than poorer quality sheepskin rugs. Typically, budget-grade sheepskins range from 80-90 cm in length, whereas Overland's premium Australian sheepskin rugs must meet a minimum length of 97 cm. Shape is equally important as length—look for sheepskin rugs with a nice, full shape and rounded neck area. Lower-grade sheepskins can be longer and thinner, with pointy neck areas designed to achieve a specified length. Now that you know the ins and outs of what makes a quality sheepskin, make sure to check out our beautiful collection of premium Australian sheepskin rugs, which have gone through a rigorous grading process to ensure we're only offering you the best. In fact, for every rug that meets Overland's standards, there are hundreds that don't make the cut. So take a rug home, feel the difference—we guarantee you won't be disappointed.